On 3 April 2018, the World Gourmet Summit Awards of Excellence (AOE) 2018 honoured 31 outstanding professionals and establishments from the F&B and hospitality industries and more specifically 4 from the region of South East Asia. 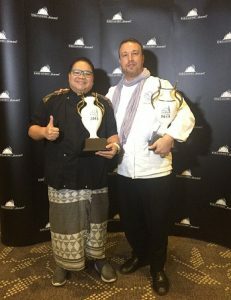 Of the four Regional Awards 6 had candidates from Indonesia and 2 of them were awarded the Awards of Excellence – Chris Salans of Mozaic Restaurant as Best Restaurant of the Year and Ragil Imam Wibowo of Nusa Indonesia Gastronomy. This is the third time that Chris Salans receives such award but it is the first time that Indonesia has more than one candidate selected as finalists. “I am proud to see that more and more restaurants and chefs in Indonesia are making it into the finals of such prestigious regional awards. It really shows that Indonesia is raising in the ranks of the culinary discipline. This is a great sign for Indonesia and I hope it will entice more Indonesian Chefs to go into the field of fine dining that showcases Indonesian cuisine or ingredients” says Chris Salans. Chris Salans is the first chef in Indonesia to have setup an independent fine dining restaurant in 2001 at Mozaic restaurant in Ubud, Bali. He is considered a pioneer by many of his pears and has put Bali on the world map of culinary destinations.